Natural Calm Plus Calcium is the brand name in the United States of a mineral and vitamin supplement marketed as a means to help balance the body specifically for people who participate in sports. The supplement contains vitamins D3 and C as well as the minerals potassium, calcium and magnesium. You take Natural Calm Plus Calcium mixed in 8 oz. of water twice a day if you participate in sports. The manufacturer claims the particular blend in Natural Calm Plus Calcium helps make the best use of the essential vitamins and minerals it contains. Each dose of Natural Calm Plus Calcium contains 350 mg of magnesium citrate, the manufacturer claims in its "Supplement Facts" label. This accounts for 87 percent of your daily requirement of the mineral. At normal levels, a magnesium supplement does not typically cause side effects other than an initial bout of diarrhea when you start using it. However, if you take too much magnesium, you may experience temporary and non-serious side effects such as nausea and abdominal cramping in addition to diarrhea, the Memorial Sloan-Kettering Cancer Center relates. Natural Calm Plus Calcium contains 230 mg of calcium gluconate per dose, the company states, or 23 percent of the recommended daily requirement. This mineral, too, can cause you to feel nauseous, and you may vomit because of this, particularly in the early stages of use of the supplement. Drugs.com also indicates that calcium gluconate can cause a decrease in your normal appetite and that it may make you temporarily constipated while your body adjusts to it. Your urination also may increase. These types of side effects typically do not constitute serious problems and generally go away on their own in a few days. Since Natural Calm Plus Calcium contains a small amount of potassium, you might not get side effects. 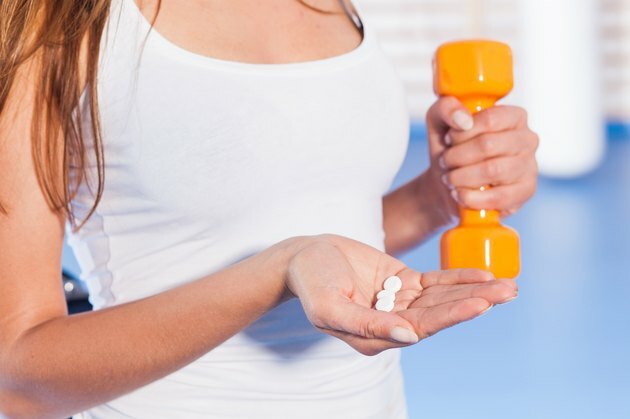 However, the University of Maryland Medical Center indicates that potassium supplements can interfere with many medications, so you will need to seek your physician's advice before you use this product. If you do experience side effects, you may have such temporary, non-serious problems as nausea and diarrhea. The University of Maryland Medical Center also notes that serious side effects affecting your heart may occur if you ingest high levels of the mineral. For this reason, keep track of how much potassium you consume as a combination of Natural Calm Plus Calcium and other supplements. If you notice a reduced heart rate or a change in rhythm in your heart, go to the emergency room for help. Vitamin C, in normal doses, also rarely causes side effects. However, because Natural Calm Plus Calcium contains a large amount of it — 290 mg, or 483 percent of the recommended daily amount in each dose — you may potentially have serious problems from it. MayoClinic.com notes that large doses of vitamin C can produce severe diarrhea and nausea, as well as kidney stones and gastritis. Gastritis is a condition in which your stomach lining becomes irritated and inflamed. Speak with your doctor if you develop these problems. Vitamin D3, or cholecalciferol, is the most common over-the-counter vitamin D supplement. You usually would take it to alleviate a vitamin D deficiency that could make it difficult for your body to absorb adequate calcium. Natural Calm Plus Calcium contains only 115 international units of vitamin D3 per dose, or 28 percent of the daily requirement. By itself, D3 does not typically cause side effects unless it allows too much calcium absorption in your body. This can result in side effects associated with calcium. The other major ingredient in Natural Calm Plus Calcium is boron. Drugs.com notes that there is little evidence of its efficacy for human health benefits and also notes that "boron compounds can be toxic to humans." This supplement contains 290 micrograms of boron citrate per dose.